​An easy Gruffalo-themed gingerbread recipe for adults and children to make together from Julia Donaldson's fun-packed cookery book Gruffalo Crumble and Other Recipes. 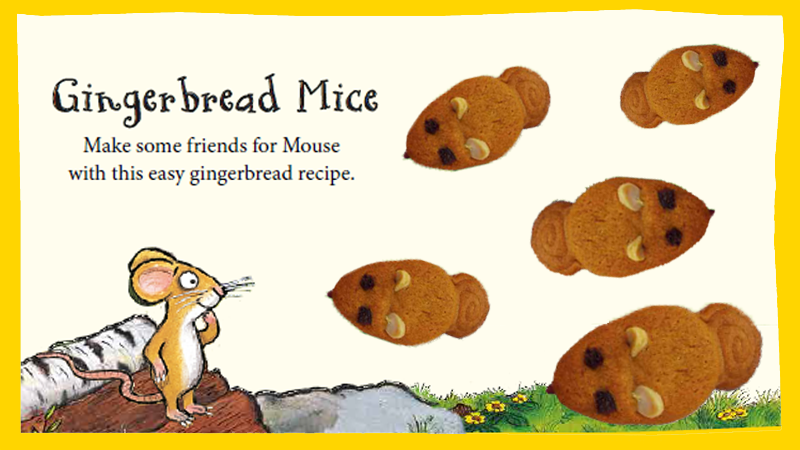 Make some friends for mouse with this easy Gruffalo-themed gingerbread recipe for adults and children to make together from Julia Donaldson's fun-packed cookery book Gruffalo Crumble and Other Recipes. 1. Preheat the oven to 180˚c/gas mark 4. 2. Dip a piece of kitchen paper in some butter and grease the baking tray. 3. Melt the butter, sugar and honey in the saucepan over a low heat. Leave to cool. 4. Mix the flour, bicarbonate of soda and ground ginger in the large mixing bowl. 5. Pour the warm butter mixture into the bowl. make sure it’s not too hot! 6. Mix with your hands to make a stiff dough. If it’s too sticky, you can add a little more f lour. If it feels too dry, add a splash of water. 7. Divide your dough into thirteen pieces and roll into balls. Put twelve on the baking tray and keep the thirteenth to one side. 8. Flatten the twelve balls with the palm of your hand and pinch into a teardrop shape. These are your mice. 9. Roll out the last ball into a long, thin sausage and cut into twelve with a butter knife. 10. Curl each little sausage into a snail shape to make the mice’s tails. stick one behind each mouse. 11. Cut the cranberries and raisins in half with a pair of scissors. 12. Stick the halved raisins on as eyes, and a halved cranberry for a nose. 13. Separate the peanuts in half. they should come apart easily. press two halves into each mouse to make ears. 14. Bake for 5-8 minutes.